But first, a little background information: Gaiki is a revolutionary online gaming service which lets its users play numerous games within our web browsers. Gaiki is led by David Perry and uses server side streaming technologies to enable in-browser gaming. For Gaiki to function on desktop computers, Flash must also be present. 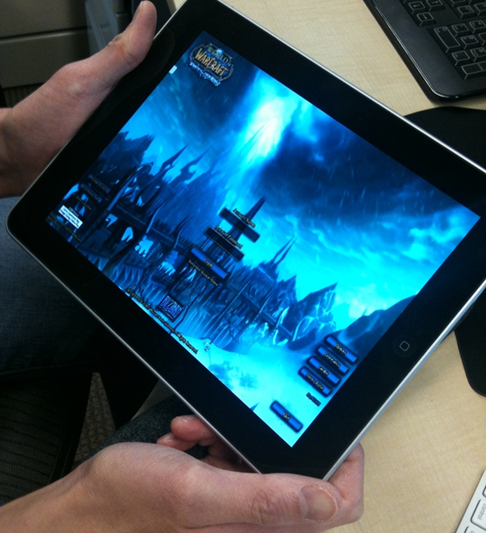 Just recently David has posted a picture of the World’s most popular video game, World of Worldcraft, being streamed to the iPad. His post can be found here. He does not provide details as to how he achieved this, or whether he is actually playing the game on the iPad or simply streaming a video. If he was playing, it would be interesting to see how he manipulated Gaiki and server side streaming in order to make the game available on iPad because there is no Flash present on the device. Otherwise, game enthusiasts who use Gaiki have little hope of Gaiki or any other Flash-requiring games porting over to the iPad anytime soon. World of Worldcraft? Never heard of it.